This product supports the Myanmar Government- KG Level (December 2015) curriculum. It is one of 63 songs approved for KG Level education in Myanmar. This song poster uses Myanmar font only. 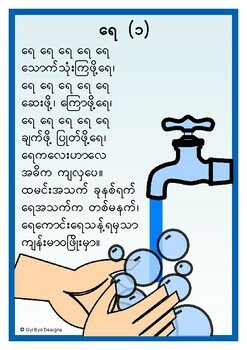 A useful resource for those learning to read Basic to Intermediate Myanmar (Burmese) script. ‘KG SONG 40- MYANMAR’ is a 2 page pdf.